Cutty Sark was built in Scotland at Dumbarton on the River Leven. She was launched in November 1869, making her one of the last clipper ships to be built. As such, she was able to incorporate much of what had been learned in building this very fast class of sailing ships and can be regarded as the pinnacle in clipper ship design. 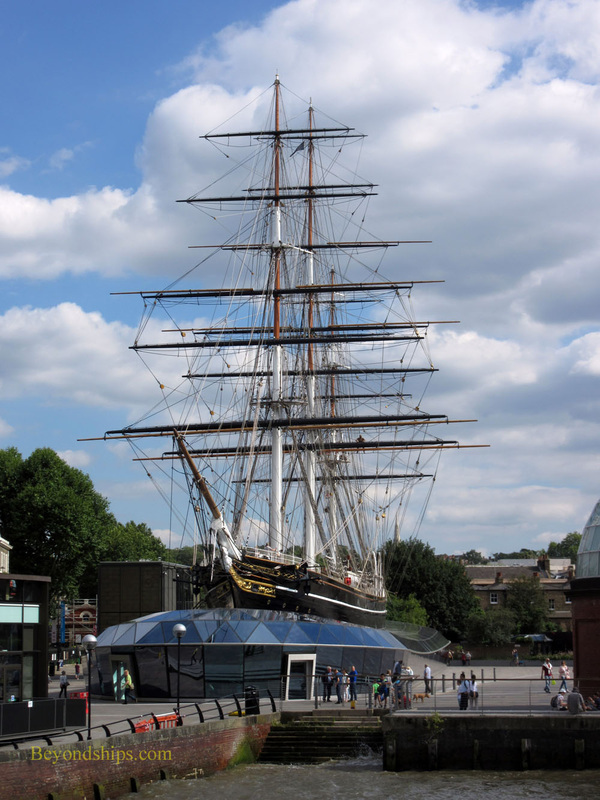 The name Cutty Sark comes from an old Scottish legend, popularized in a poem by Robert Burns. Tam O'Shanter was returning from the market one night when he came upon a coven of witches dancing around a fire. His attention was drawn to a young, pretty witch, Nanne Dee, who was dressed in a short chemise - - a cutty sark in the old Scottish language. Tam became so engrossed in her dance that he forgot that he was in hiding and called out “Well done, cutty sark!” Angered that they had been spied upon, the witches took off chasing Tam. He rode for dear life towards a river knowing that the witches could not cross running water. Tam reached river just as Nanne grabbed the tail of Tam's horse. The tail came off in her hand but Tam was safe. There is no record of why this name was selected for the ship. However, the ship's figure head depicts a scantily clad witch flying with a horse's tail in her hand. The ship is a composite of various materials. Much of the deck and sides is East India teak but the ship's bottom is American elm. The wood is on a cast iron frame. Her masts are also iron. Stronger than wooden masts, they enabled Cutty Sark to carry more sails and thus obtain more speed. Also enhancing her speed is the hydrodynamic shape of her hull. Her designer, Hercules Linton, made her long and narrow with a sharp bow to cut through the waves. It was also stronger than previous ships, thus contributing to her ability to carry more sail. Cutty Sark was designed with the China tea trade in mind. Tea was first imported to Great Britain in the 17th century as a medicine and a luxury drink. A century later, it had become the national drink. It had also become very popular in the Netherlands. As a result, the importation of tea from China became a very lucrative business. The longer tea in on a ship, the greater the chance that it will spoil. Therefore, faster and faster ships were built for the tea trade. The “tea race” grew from a matter of business to a matter of national pride with the general populace following the exploits of their favorite ships and making wagers. For ship owners, the faster their ship, the more they could charge for carrying a cargo. When Cutty Sark entered service, Thermopylae was widely acclaimed as the fastest clipper ship and Cutty Sark's owner John “Jock” Willis set his sights on upsetting Thermopylae. The opportunity came in June 1872 when the two ships left Shanghai on the same day bound for Britain. Cutty Sark opened up a 400 mile lead over Thermopylae. However, Cutty Sark's rudder broke in high seas. Captain George Moodie would not give up and the crew repaired the anchor twice while still at sea. However, because of the rudder problems, Cutty Sark arrived in London seven days after Thermopylae. Although Thermopylae had won the race, the public was so impressed by Cutty Sark's performance and the courage of her crew, Cutty Sark achieved a national reputation. Still, the sun was setting on clipper ships in the China tea trade. The Suez Canal had opened in 1869. Steam ships could easily transit the canal but a sailing ship, dependent on the winds for power, could not do so easily. Also, the clipper ships relied on strong winds for speed and the relatively light winds of the upper Red Sea did not suit their design. Thus, while clipper ships had to sail around the Cape of Good hope to get from China to Britain, steam ships could travel through the Mediterranean - - a savings of some 3,300 nautical miles. Soon even the fastest clipper ships were unable to obtain a cargo of tea. Cutty Sark transported her last tea cargo in 1877. Then began a dark six-year period in which the ship sailed from port to port looking for cargoes. During this time, a seaman killed the first mate, a captain committed suicide and another captain was relieved of his command for starving the crew and pocketing the wages of non-existent seamen. But Cutty Sark's glory days were still ahead. In 1883, she carried a cargo of wool from Australia to England in 77 days. This was a month faster than any previous ship. Under Captain Richard Woodget who joined the ship in 1885, Cutty Sark continued to improve her performance. Woodget would take the ship into the far southern latitudes in order to catch the strongest winds even though this meant dodging icebergs and enduring gales. Cutty Sark remained the fastest ship on the Australian trade for 10 years and became one of the most famous ships in the world. In 1889, the public was thrilled to hear an account of how Cutty Sark had overtaken the P&O steamship Britannia. According to Britannia's second officer, a sailing ship appeared far astern. Even though Britannia was doing 16 knots, the sailing ship overhauled the steamer and soon disappeared over the forward horizon. 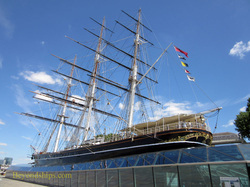 Estimates were that Cutty Sark was doing more than 17 knots - - a remarkable speed for that day. As technology improved, however, steamers came to dominate the Australian wool trade as well. Consequently, Cutty Sark began to make less money for her owners and in 1895 was sold to a Portuguese firm J. Ferreira & Co. Renamed Ferreira, she carried a variety of cargoes from place to place. By 1922, the ship was the last clipper ship operating in the world. A storm in the English Channel drove her into Falmouth harbor to repair damage. There she was spotted by a retired sea captain Wilfred Dowman who was so impressed, he offered to buy the ship. His offer was refused but not long after, the ship was sold to another Portuguese firm and renamed Maria do Amparo. She did not retain the new name for long as Captain Dowman was determined to buy the ship. He offered the new owners substantially more than the market value and the ship was his. Renamed Cutty Sark, the ship was brought back to Falmouth and restored to her condition when on the China and Australian trade. She became a cadet training ship and was opened to the public as a tourist attraction. After Dowman's death, Cutty Sark was sold and became an axillary vessel for the cadet training ship HMS Worcester in Greenhihe, England. By the early 1950s, the college decided that Cutty Sark no longer suited their purposes. In 1951, however, Cutty Sark was towed up the Thames to be part of the Festival of Britain celebrations. This again brought the ship to public attention and sparked a movement to preserve the ship in which the Duke of Edinburgh was active. As a result, in 1954 Cutty Sark was brought to the dry dock in Greenwich, which is now her permanent home. After three years of restoration work, she was opened to the public by her majesty Queen Elizabeth II. In 2007, while closed for further restoration work, Cutty Sark caught fire and was severely damaged. However, because of the restoration work, much of the original ship had been dismantled and its historic artifacts had been moved elsewhere. 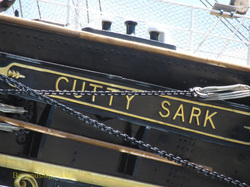 As a result, Cutty Sark was able to be repaired and restored to her former glory. The Queen, accompanied by the Duke of Edinburgh, reopened the ship to the public in April 2012.